Great value was at the heart of Frank Woolworth's original formula. The principle of offering jaw-drop prices on everyday things helped the 5 & 10¢ and the 3d and 6d Stores to become the leading retailer either side of the Atlantic. But in modern times the chain followed the trend up=market, introducing fashion and style into ranges, and allowing prices to become less differentiated compared to the competition. 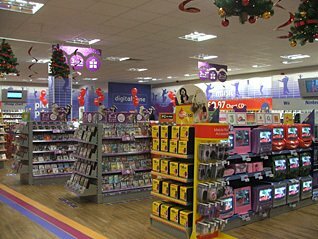 In the UK in the early 2000s the Kids and Celebrations strategy opened the door for pound shops to usurp Woolworths' traditional role as a value store, as shoppers deserted the stores when searching for household goods and knick-knacks. WorthIt! marked a conscious effort to stop the rot and add a selection of well=made items at unbeatable prices. Sales on the new lines had risen to £1 million a week, achieved with no impact on the turnover of other things, with plenty of potential still be tapped, when problems elsewhere in the business brought it tumbling down. Throughout the Woolworths Museum we've told the story of a value store, that became famous for selling mass-produced commodity items and the occasional luxury line at jaw-drop prices, before it lost its way. 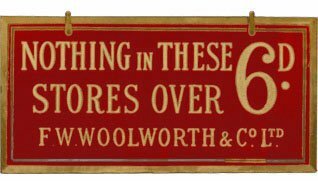 Indeed 'Nothing over Sixpence' was the brand essence of the British stores, that underpinned expansion from a single store in Liverpool's Church Street in 1909 to a national institution with 768 outlets by World War II. The decision to suspend the sixpenny maximum was only taken as a last resort at the height of the Battle of Britain in 1940. The new Woolworths that emerged after the war had no upper limit, but continued to offer unbeatable prices on an ever-expanding range. During the Kingfisher years, despite a general move up-market, CEO Sir Geoffrey Mulcahy insisted that the value heritage be maintained. As a result, alongside an improved store environment, the 1990s saw a series of value initiatives, including 'Street Value', 'Drop Down' and 'Woolies Value'. But, after demerger, for a while the value message took a back seat. The new Kids and Celebrations offer was principally focused on aspirational products. It targeted young upwardly-mobile families, rather than the mass market. Some of the new ranges were stylish, but pricey. For example a new selection of Greetings Cards was more fashionable, but was not a penny cheaper than the selection at Clinton's, W.H. Smith or the corner shop. Similarly, new fashion-led home adornment lines were outstanding value, but were pitched at a more discerning customer than the bin bags and clothes pegs of earlier times. The reputation for low prices diminished. Surveys showed that a growing number of shoppers believed that Poundland, Wilkinsons, and even the supermarkets were better value. When Trevor Bish-Jones joined Woolworths as CEO in March 2002, he told viewers of a corporate video that seven million customers visited the stores each week. By 2007 the number had fallen to four and a half million. In other words in the first five years of his new strategy, a thousand less customers visited each day than the last. After two years of profit decline the Chairman, Gerald Corbett, decided it was time to act, hiring new talent to bolster the Board. His choice of Tony Page, headhunted from the Non-Food Portfolio at Asda to be 'Managing Director - Commercial', was well received by the media, who rated him 'quite a catch'. Page told a packed meeting at the Marylebone Road HQ that, for him, the Woolworths name had always stood for value. But recently product availability on the counters had been weak and the value-for-money message had faded. He believed the situation could be redeemed by sharper retail discipline and by tackling a major shortcoming in the construction of the range. Competitors had built ultra-cheap value own-labels known as 'low entry price point ranges', leaving Woolies behind. After a lengthy period of chasing 'margin basis points', where the chain's primary goal had been to drive up profitability on declining sales, the Page formula sounded like heresy. He proposed new ranges of similar items at much lower prices, arguing that despite lower profit margins on each individual product, the massive increase in volumes sold would more than make up for the shortfall. Buyers were sceptical, believing that cheap alternatives would cannibalise the sales of their most profitable lines. 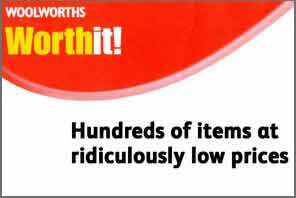 But they had little choice but to go along with their new boss's plan to introduce a 500-strong range of value products in the Autumn of 2006, which was branded 'WorthIt!'. Drawing on his experience at Asda, Tony Page evangelised the steps necessary to develop the range. He asked his Buyers to work closely with their suppliers to ascertain the key cost drivers in making goods for Woolies. If Buyers had asked for something costly or complex to be done, they should re-think, and if the supplier had ideas about cost-cutting, they should listen. Products should be specified with 'no frills' but be of decent quality. To receive orders suppliers had to guarantee availability against a sales forecast. Not a single point of the message was new. It repeated the basic principles that Frank W. Woolworth had followed a century earlier. The approach can be illustrated by a simple Light Bulb. Sales had fallen over the years. 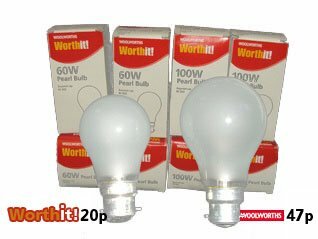 The MD's solution was to specify a bulb that emitted the same amount of light, and lasted for the same amount of time, but could be sold much more cheaply. He bought in depth and kept the line in stock. The WorthIt! bulb was slightly smaller, but shoppers still bought vast quantities. Members of the environmental group Greenpeace were livid when the incandescent bulbs were sold for 20p. They set up a picket outside the firm's HQ. Page harnessed the passion, engaging them and securing their assistance in a fight against tariffs on low energy bulbs entering the EU. The next season he offered the 'green' stick bulbs for 50p each, a full pound cheap than anywhere else. Most items in the WorthIt! range were basic, and functional rather than elegant. Bold displays and jaw-drop prices encouraged customers to buy on impulse. 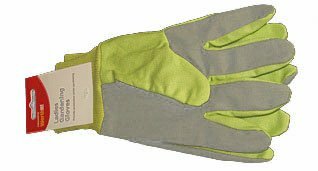 Gardening gloves were a typical line. They were a quarter of the previous price, but contributed the same cash profit. 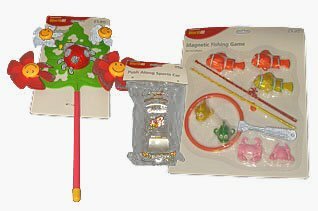 Similarly, a magnetic fishing game proved a family favourite. The 'quintessentially Woolies' line was cheap to make, well presented, and fun to play with. WorthIt! sweets and drinks were another surprise hit. In a market dominated by big name brands, and with pic'n'mix already a firm favourite, sales of bagged confections from British manufacturers rocketed. Bags of Mint Imperials overtook the combined sales of the branded equivalent and the equivalent pic'n'mix line within days of their launch. The Buyers excelled, negotiating higher margins on WorthIt! products than on everyday lines. The higher sales volumes meant the lines contributed more cash margin that the dearer equivalents. Increased footfall meant sales of the up-market ranges also rose. They proved one of Frank Woolworth's guiding principles : "We make our money not by selling a little for a lot, but by selling a lot for a little." By Spring 2007 WorthIt! sales had topped the £1m mark. Page responded by doubling the size of the range. Although the WorthIt! launch came too late to avoid the first annual loss since 1910, the concept found favour with investors and the press, generating high expectations for the new broader range planned for the Spring of 2008. 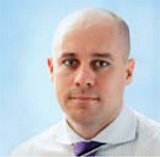 Behind the scenes the Buying team had leveraged their muscle in the Far East and the expertise of the Group's Buying Office, Woolworths Group Asia Limited, to develop bolder, bigger ticket products at the same jaw-drop prices as the original million selling range. The extended offer consisted of more than a thousand lines. At the launch these were given extra space at the front of the store, allowing customers to browse the entire WorthIt! range from the same display. Among the new lines from the Far East were Kettles, Toasters and Irons. They were plain white and very basic. But the initial £5 price still allowed a £1 margin. Other winners included upright vacuum cleaners (£20), Microwave Ovens (£30), Radios and Televisions (£5-£100). 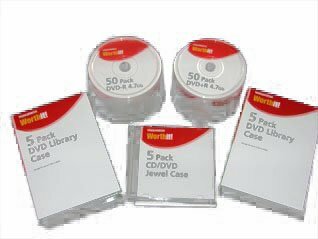 Blank CDs and DVDs and packs of jewel and library cases sold in such large quantities that rivals had to introduce similar lines to compete. An innovative four-pack of DVD-Rs for 99p even hit sales in the pound shops. The extended range boosted weekly WorthIt! sales towards £2m during the Spring of 2008, with more to come. The Group wholesale distributor EUK was sceptical at a request to develop a WorthIt! music label. Page sought 20-track compilation CDs for £1, 40 track double discs for £2 and Kids DVDs from £2 to £5. 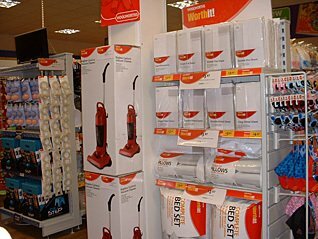 Page won through and went on to deliver a sales bonanza from bright red cardboard stands. In another controversial move, for the first time in a generation Buyers were asked to source a selection of non-Ladybird children's clothing basics. The WorthIt! lines were made to lower quality standard, without the traditional double-stitching and deep colour dyes. In early 2008 Woolworths signed a partnership arrangement with Somerfield Supermarkets. Mini-Woolworth stores were opened as concessions in some of their surplus space. Somerfield also requested a WorthIt! 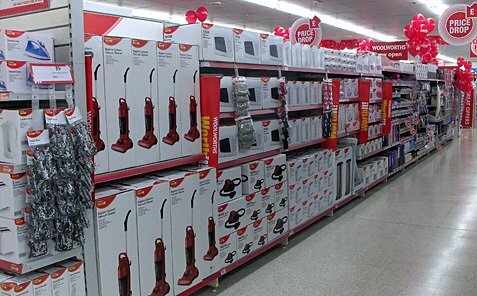 range to sell from the promotional aisle in some of their other stores. An extension of the arrangement was under consideration when news broke that Somerfield was to join the Co-operative and needed a pause to complete an integration. After the demise of Woolworths the tables were turned, as the Co-operative took leases on a number of the High Street retailer's former stores across South East England. Far from being just an oasis in the desert, WorthIt! drove the first sustained increase in shopping traffic to Woolworths for over twenty years. From a standing start it had already established itself as a£2m brand within eighteen months, and had plenty of potential to grow further.